Sometimes marketing pieces catch my attention and create thought. I look at the message, call to action, and design elements of the marketing. I consider the effectiveness of the piece in my life and think about how it might be received by others as well. In an effective marketer’s toolbox of tricks is the ability to create a perceived need for their products and services. But can we take back the prize from the rabbit or will we fall to seduction of the message? Is data driven marketing like the creeper? People like messages that are relevant to them. Someone once said to me, “If it can help my life then good, otherwise don’t waste my time.” But is it a little creepy to think about how much the marketer knows about us? My wife and daughter comment all the time about online ads that show products they searched for a couple of days ago. They call it big brother. I call it big cookie. I received a letter via postal mail from the “Acura Vehicle Acquisition Department” this week. They’ve been after me for several years because they want me to trade-in my 2004 Acura for a newer model at a local dealership. What they know about me is that I purchased a 2004 model Acura from them as a pre-owned vehicle in 2007. I suspect, but I’m not sure, that they know I still own the car. (probably by-way of some public data record source on the vehicle VIN) The letter uses variable elements of my name, the year/model of the car, thee closest Acura dealer to my home, and the sales manager’s name at the dealer. This form of marketing at least takes an educated guess that I may be in the market for another car since the one I have is ten years old. But it ends there. The call-to-action and marketing offer say they’ll keep my payments the same on a newer vehicle on their lot. That of course would be a neat trick since I’ve owned the car for years. Can they match $0 monthly payment? 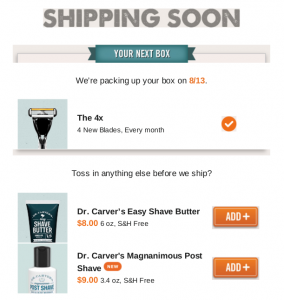 A few weeks ago I wrote about subscribing to the Dollar Shave Club. It’s time for my first monthly supply order and I received an email from the company this week with notification. I was thoroughly impressed with the email. They informed me the date of my shipment, the contents of the shipment, and offered to put additional related products in the package if I notified them before it shipped. That email is a great case study in both marketing and customer service. I like the cross sell for additional products with both product photo and price. The call-to-action is very clear with the big button for purchase. How easy could it be? Certainly I’m aware that the company’s “shaving butter” is higher priced than my existing shaving creme. But the product does work differently from the creme and maybe I would pay a little extra not to have to pick it up at the store. Thinking about the marketer behind this email I see several advantages they have. They use my customer profile to establish the base of the message. (What I’ve ordered in the past and when the next supply ships.) But now, they are also starting to collect more data on my usage and interests. They know I opened the email. They know when I opened the email. They’ll track to see if I order any of the complementary shaving products and could use that for future offers. Should we help the marketers? The upside to helping the marketers is that gives them opportunity to craft more personal and relevant messages for us. The downside is that it requires sharing what many consider private information. So who wins the trick?